Planting Dates: Spring after all danger of frost is over and soil temperature is at least 70°. In general, April 1 - April 30 and July 10 - July 31. Planting Method: Directly plant the seed ¾-1 inch deep. Use 3-4 seeds per spot, hill, or hole. Thin down to the two strongest and most vigorous seedlings. Pinch the unwanted ones off at the ground so the remaining roots won’t be damaged. Harvest Time: Harvest in 75-100 days, when the melons are ripe. Using transplants instead of seeds can shorten the development time by about 10 days. Height/Spread: There are large-growing vine that will climb and spread to over 20 feet. Watermelon vines need lots of room. Final Spacing: 4-10 feet, rows 6 feet apart. Hills can take up as much as 25 square feet. 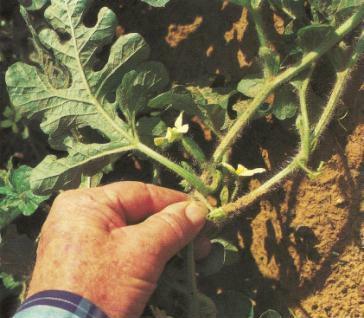 Growth Habits: Watermelon has small yellow flowers and large stems and leaves. The fruit is either yellow or red. It is deep rooted and drought-tolerant. Culture: Watermelon loves sandy soil but will grow in any soil, especially if well-prepared with compost, lava sand, rock phosphate, and organic fertilizer. Add Texas greensand to alkaline soils and high-calcium lime to the sandy acid soils. Apply a second application of organic fertilizer at 20 pounds per 1,000 square feet as the plants begin to vine. Troubles and Solutions: Aphids are controlled with soil health, molasses and water spray and release of lady beetles. Poor pollination can be prevented by encouraging biodiversity with a basic organic program. Blossom-end rot is controlled with even soil moisture and high-calcium in sandy soils, soft rock phosphate or alfalfa meal for the alkaline soils. The condition called white heart can be prevented by avoiding over-fertilization. Treat powdery mildew outbreaks with Garrett Juice plus garlic and potassium bicarbonate. Treat damping off and nematodes with cornmeal. Harvest and Storage: Watermelons are ripe and ready for harvest when the tendril nearest the fruit has completely turned dry and brown or the second one out is brown. The other method to tell whether the fruit is ready is to thump it; mature fruit has a deep, dull sound. The ground spot should be an off-yellow and rough to the touch. Will store for 2 to 4 weeks. Notes: Some gardeners like to use black plastic to warm the soil faster. Holes are cut in the plastic for the seeds. I like the natural way better. Varieties: ‘Crimson Sweet’, ‘Sugar Baby’, ‘Royal Sweet’, ‘Charleston Gary’, ‘Jubilee’. 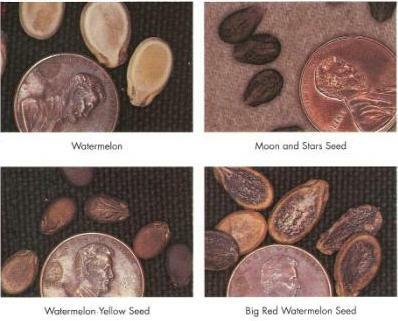 Seedless will do well in black soil but needs a pollinator such as ‘Sugar Baby’.